President Donald Trump blasted the various caravans of Central Americans heading for the US Southern Border in his first tweets of the day, claiming it was made up of some ‘very tough fighters’ after images and video surfaced yesterday of the clashes between migrants wanting to enter Mexico and the local police. His comments come as it has now become clear that three caravans of immigrants are now heading for the US’s southern border. The first caravan, still the biggest, has shrunk from 7,000 to 4,000 participants and reached Juchitan, some 700 miles southeast of Mexico City. It still has more than a month to walk before it could reach the nearest US border in Texas. The second caravan, which was filmed fighting with police at the border, entered Tapachula, Mexico, and camped out in the town's main plaza. Meanwhile, a smaller third group from El Salvador crossed the bridge connecting Guatemala and Mexico and legally entered Ciudad Hidalgo. In response to the growing threat of illegal immigrants wanting to enter the US, Defense Secretary General Mattis declared that the Pentagon would send some 5,200 active-duty troops to the Mexican border. The families of the people who died in this charade need to sue the organizers in a court of law for the unnecessary deaths of their loved ones. This is nothing more than organized terrorism, at the expense of uninformed and misinformed victims. At least the Mexicans are making the appearance of trying to stop or stall the horde of invaders. A few fox holes with belt fed mg's would be a better deterrent. A few bursts in the water in front of the leaders should put them in reverse. 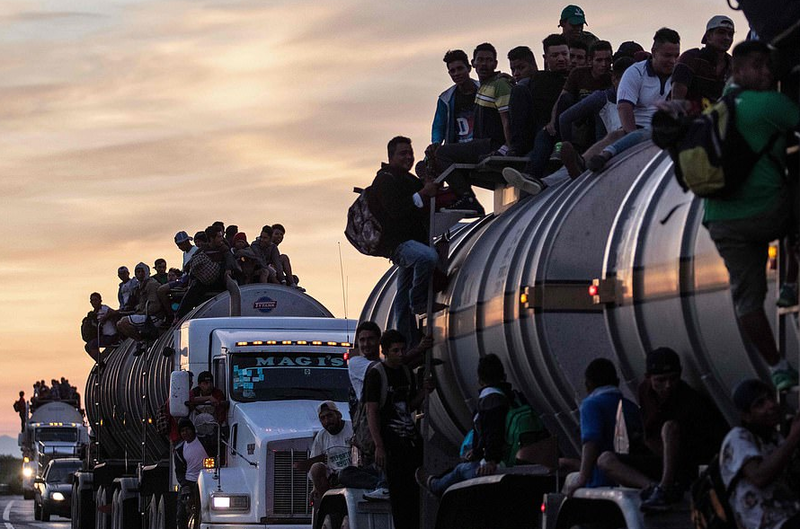 The simple fact is: this group of migrants has nothing to do with 'criminals', and there's not a god damned thing trump can do to stop them from entering America.